How do the Duggars organize a system of chores, which they call "jurisdictions," for their super-sized family? In their first book, Jim Bob and Michelle Duggar share how they use Managers of Their Chores, a resource from Titus2.com, to manage their children's chores efficiently and effectively. Keep reading to find out how you can enter to win a copy of Managers of Their Chores. 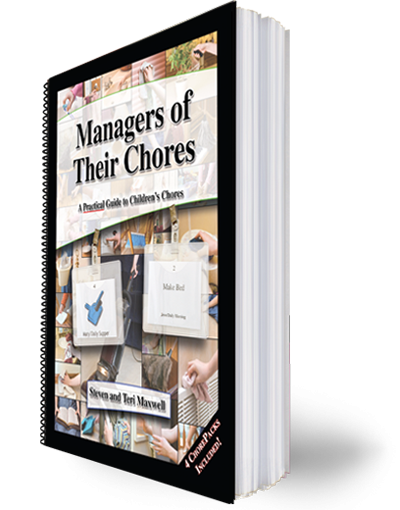 Written by Steven and Teri Maxwell, parents of eight, Managers of Their Chores provides motivation and practical advice on implementing a stress-free chore system and is useful for families of all sizes. I had heard of Michelle using the chore packs but didn't know there was a company associated with! I'm not familiar with Titus2.com. I'll have to check it out!! I AM familiar with Titus2.com. I have Managers of Their Homes, but I don't implement it. Children have too many variables daily, so we just have more of a routine rather than a schedule. Yes! I am familiar with Managers of Their Chores (MOTC). I also have Managers of Their Homes (MOTH) and Managers of Their Schools. We used to use this system. I own Managers of Their Home so this would be a wonderful addition! Yes, I've visited Titus2 several times and know who the Maxwells are. But I would love the chance to see how they organize chores! :) Thanks for hosting! we LOVE Sarah Maxwell's fictional series on the Moody family and have read every single one. Hoping for another! Another homeschool friend shared theirs with us and we became addicted! Having heard about their chore system in their books, I've been very curious about the system. I hope to win, but if not, I've asked my local library to buy a copy and I've put it on my Amazon wishlist. Thx Maxwells and Duggars for inspiring excellent homebuilding, parenting and families, it means a lot of our family and many others we know. Keep doing what God's put on your plate to do, and we will too! Actually do not think I have heard of it. Im not, but my Dad is familiar with it! I love the Maxwells. Thank you for sharing!!! Yes, we love Titus 2 Ministries. We actually use Managers of Their Chores. I cannot recommend it enough! I would love to win this for my sister. Not familiar with titus2 but this is an awesome way to manage chores! We love Titus 2 resources, especially Managers of Their Home. Awesome help for moms and dads alike! I have never read this. Interested! I am not familiar with it, but am interested! I'm familiar with titus2. My sister especially likes their books "Summer with the Moodys", "Winter with the Moodys", etc. I also babysat for a dear family I know who used their chore system for a while. It seemed to work well! It kept both the kids and their babysitter more on track! So far we have two littles and look forward to more :-) this would be a great resource for our family! I would love to have this.book. Josh & Anna just announced that they're expecting! Anna just announced on Twitter that they're expecting #4!!! Yes, I attended their conference in Wichita just last month. I have their book. And also the awsome children books written by their daughter Sarah. The Moody series. They are awsome books for kids to read. Mine love them. Yes, I am familiar with Titus 2 ministries. They have excellent resources. I have several, but not Managers of Their Chores. I've heard of the website, but I've never bought anything from it. I first heard of the Maxwell Family at a home-school conference and they were the guest speakers! They are number one great examples for any Christian family striving to seek God first with all their choices, number two they are great speakers, and number three they are all around great role models for other families young to elder. I have almost all of the Maxwell families books except the most recent Moody series books and the Managers of Their Chores book. I very highly respect them and my family has gained greatly from them and their resources and examples! I have not heard of Titus2. I have heard of them! I was familiar with the system when Michelle showed her chart in an early episode of their show. I would love to win this, I really need help with chores! I am. A friend of mine uses this system and lent me the book a while back but I would love to win my own copy! I'm not familiar with Titus2.com. I would enjoy winning, think it would have helped me when my sons were young. I would love to introduce this to my son and his wife. Thanks for hosting this giveaway! It looks great! We love Titus 2 ministries and would love this book! Yes, would love this resource! I've read several of Teri's books. My family also attended one of their conferences. What a wonderful family. Getting my kids to do chores is a chore itself so this book would be great! Never heard of it - but I'd love to win! Yes, I am familiar with Titus 2. The kids love the Moody books. Love them....Would love that book. I have not ever heard of Titus2.com, but I am now interested in looking at their stuff! I am the oldest of 7 kids!! My mom would love this for Christmas! I don't know if I am posting right? I've tried twice, but don't see my comment. But I would love yo win the book! I would love this book, I've heard it is a great resource! I originally heard of Managers of their homes quite a few years ago and I have wanted to get it. Then when I started watching the Duggars and reading their books, I heard about Managers of their chores. I would love to eventually get all three of the books. I am a stay at home homeschool mom of 6 kids and I think these books would really help us. I think it is wonderful that you are giving away Managers of their chores. I have heard of titus 2 from a duggar show a long time ago. I love the Duggars! They are so inspiring! Thank you for doing this blog. I love the Maxwell's materials! I have several of their books, but have really been wanting the Chore book! Yes, I order from there occasionally! I've heard of them but not used their materials. Looks great! I'm not familiar with Titus2.com, however this looks really interesting! I'm not familiar with that website, but the scripture is great, so I'm sure the resources on the website are wonderful too! I have hearf from it but never used it before. I know several who have used this & benefitted--I would love to have this resource--thanks for the opportunity! Love -- would greatly appreciate to win !